During 2014 there will unfortunately not be any performances. We are working hard to be able to present something for next year instead. 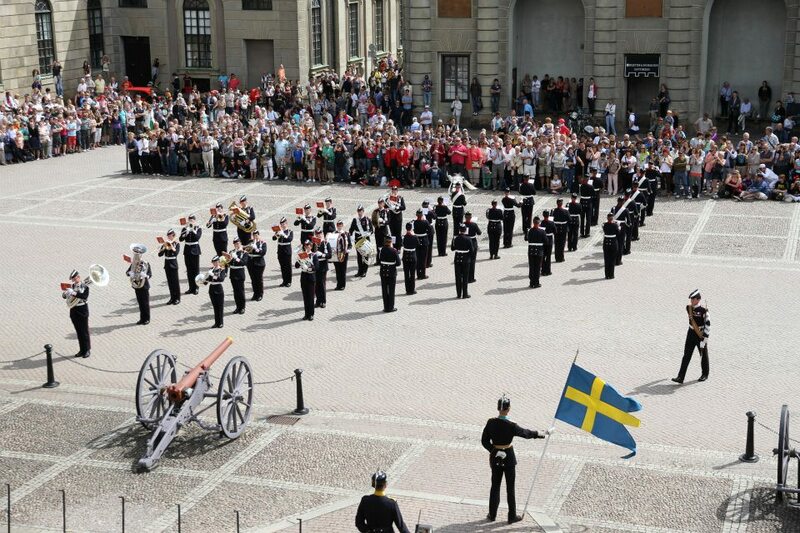 The Veterans of the Swedish Army Band performed during the changing of the guards at the Royal Palace in Stockholm, this time 30 July - 1 August 2013. We also held a concert at the Royal Mews. The Veteran Band performed during the changing of the guards 21-22 July and also held a concert at stortorget 21 July. The purpose of our association is to gather former conscripts and officers at AMK and have fun together, mainly by each year creating the band "The Veterans of the Swedish Army Band". In addition, we are committed to the preservation and development of the Swedish wind- and military music tradition and to promote the symphonic wind orchestra as ensemble form. We also strive to support, highlight and popularize the activities of the Swedish Army Band (AMK), preserving its traditions and asserting its unique role in the Swedish music scene.